Moya McKenna, Eater, 2019. Oil on canvas, 97 x 84cm. Courtesy: the artist and Neon Parc, Melbourne. For her first solo show in seven years, Moya McKenna pushes her paintings into deeper psychological and raw terrain while continuing her slippery interplay of abstract and realist sensibilities, and bold gestural expressionism. An image sourced from the Internet of a lion devouring a zebra forms the reference for these works, a significant development from her still life painting practice. 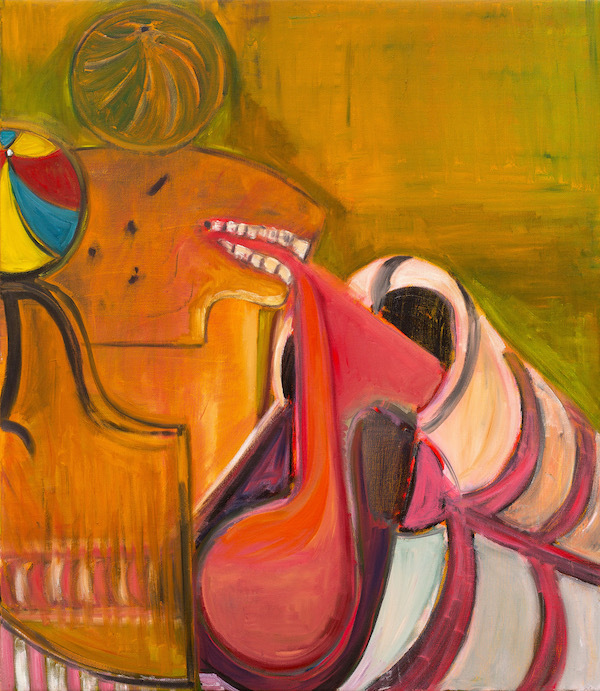 Gnashing teeth, zebra stripes, a rib cage, fruit, torn flesh and a beach ball populate the paintings, taking on different incarnations and roles in each work. With an ambiguous rendering of predator and prey, they ruminate on complexities of nurture, nature, play and motherhood. « Tony Mott: What a Life!